Slavery forced antebellum Americans to confront history in new ways. These confrontations encouraged new considerations about the relationship between the present and their sacred religious and legal historical texts—the Bible and the Constitution—and their corresponding favored historical pasts. In the first decades of the new republic, the presence of pasts made familiar through uses and interpretations that conflated historical differences and collapsed historical times guarded Americans from the more disorienting intellectual upheavals of historicization. However, when the slavery crisis fueled a growing emphasis on historical and contextual interpretation in both biblical and constitutional debates, it fostered an awareness of historical distance of the sort that encouraged more historically attuned readings and applications of both the Bible and the Constitution. The process marked an important development in American historical consciousness: the historicization of the nation’s most transcendent, familiar, and useful historical eras and associated historical texts signaled that all periods were subject to temporal vicissitudes and that qualitative changes and contingencies divided all historical eras. This marked an important step in the understanding that each historical period existed as a discrete temporality. In this way, southern slavery contributed to the introduction of a modern American historical awareness. When I arrived at the Watkinson, I set out to further explore the spread of contextual interpretation in biblical and constitutional readings and to examine the overlap between those readings. In the first source I read—Samuel Cary’s published sermon, Ignorance of the True Meaning of the Scripture (1814)—I encountered a clear statement signaling the trend toward the kinds of historical readings of scripture that biblical criticism encouraged. 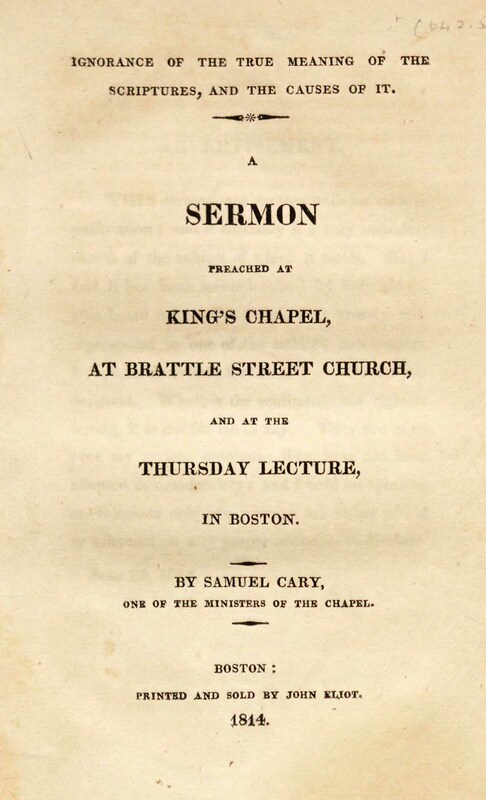 A Harvard graduate and a Unitarian minister, Cary explained to his Boston Battle Street Church congregation that most Christians are but imperfectly acquainted with the facts relating to this book, which have been brought to light by the reseaches [sic] of biblical criticism. In order to comprehend rightly the works of men who lived at a very remote period, and who wrote with particular objects in view, and are known to have accommodated themselves to the circumstances of their own time; it is manifestly necessary, that we should know something of the state of the world at that period generally, and of the particular state of those individuals or societies, who are in any way concerned in these writings. This source lends further credence to the idea that a broad range of America’s biblical exegetes explicitly called for historical readings of the Bible. The biblical debate over slavery that grew and developed in the succeeding decades led some to ignore the historical approach, but others, including the eminent biblical scholar Moses Stuart, used just such an approach to explicate the scriptures and to explain their meaning for Americans relative to southern slavery. In this same period, a similar development emerged in constitutional interpretation. Americans began to read the Constitution, a text from a period much closer in time than the biblical past, in relation to its historical context. In my manuscript, I contend that the passing of the founding generation spurred an interest in uncovering the founders’ and framers’ writings, which encouraged the use of historical sources—such as Madison’s Papers (1840)—to determine the meaning of the nation’s supreme legal text. 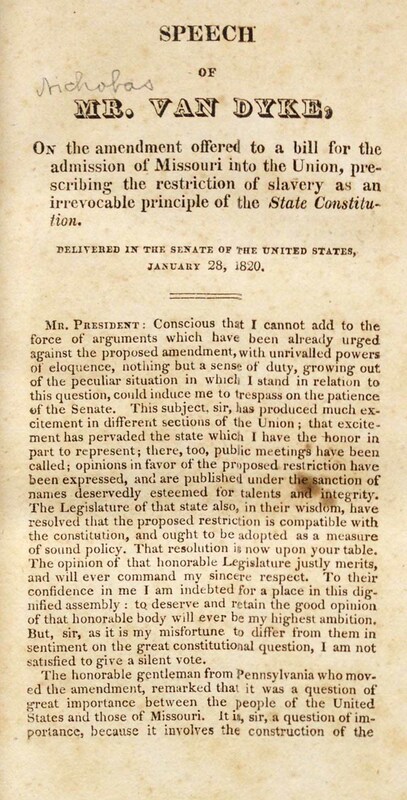 The attempt to read the Constitution in light of the framers’ intent, a process that required historical narration, received official sanction in Dred Scott (1857). While the emphasis on reading the Constitution as a historical text spread and developed in the 1840s and 1850s, the prospect was present much earlier. While at the Watkinson, I read Delaware Senator Nicholas Van Dyke’s speech On the Amendment Offered to a Bill for the Admission of Missouri (1820). In the speech, Van Dyke reasoned against the Tallmadge Amendment, which would gradually abolish slavery in the proposed state of Missouri. In his argument, he gloried in his nation’s penetrable past: “Its history is brief, and known to all: the time and manner of its creation, the circumstances attending its adoption are recent and familiar. Many of the enlightened statesmen whose talents and labors were devoted to this great work, yet live to share the honors which their grateful country bestows, as a reward due to their distinguished merit.” Ironically, the emphasis on contextualizing the Constitution became more emphatic after those “enlightened statesmen” had passed on. And in the 1840s and 1850s, historical interpretations began to show that profound historical differences separated the founding era from the present despite the relatively brief time separating the two periods. Indeed, its penetrable nature made historical distance all the more clear once the slavery debate directed interpreters to plumb its depths. I encountered most of Channing’s writings within bound volumes of pamphlets on the slavery issue, arranged chronologically. These volumes led to perhaps the most interesting insight that resulted from my perusal of the Watkinson’s collections. While looking for particular pamphlets that engaged the biblical and constitutional debate over slavery, I discovered a host of related pamphlets, including moderate antislavery and proslavery southern writings. In perusing these sources, I discovered further evidence of the close interpretational ties between moderate antislavery and proslavery readers. A number of moderate northerners appear in my dissertation, including Daniel Webster and Moses Stuart, but only a few southerners show up, including Roger Taney, and thus the southern voice remains in the background of the narrative. I argue that slavery increased historical awareness among a number of abolitionists, leading some of them to dismiss the Bible and the Constitution as outdated texts or, more persuasively, to argue that the historical distance demanded new readings. To be sure, some abolitionist writings—more of which I discovered at the Watkinson—put forth biblical and constitutional interpretations that conflated temporal distance and collapsed time. However, moderate antislavery thinkers who desired peace and, especially, southern proslavery writers who aimed to justify the historically legitimate institution, were most invested in static readings of the Bible and the Constitution that ignored historical distance. Southerners often drew attention to abolitionism’s perceived willingness to dismiss and condemn the nation’s authoritative religious and legal historical texts. For example, an 1850 article in The United States Magazine, and Democratic Review condemned William Lloyd’s Garrison’s ideas, the “dogmas of the New Messiah,” and his followers, “who believe neither law or Gospel.” Many southerners who condemned Garrisonian attacks on the nation’s sacred historical texts juxtaposed those venerated sources with the innovation of abolitionism: “Either abolitionism must be put down, and the ancient, time-honored, venerable old Christian church sustained against these marauders and moss-troppers, or an entire new system of government corresponding with the new code of piety and morality propounded by the new expositor of the Gospel, must be adopted.” Both abolitionists and proslavery writers attacked opposing developments as corrupt innovations. But while many abolitionists highlighted proslavery consolidation as a deviation from antislavery expectations—either biblical or Revolutionary—proslavery writers portrayed abolitionism as a deviation from biblical and Revolutionary realities. A number of northern moderates joined southerners in similarly critiquing abolitionism. For example, in a sermon delivered in South Berwick, Maine, in late 1850, Congregationalist Benjamin Allen Russell praised the “immortal Constitution,” a “sacred instrument” that demanded obedience to ensure the nation’s continued existence. Showing signs of the drive toward Dred Scott, he insisted that “the decision of the Supreme Court … is the decision of the nation.” He combined the appeal to the supreme legal text and the Supreme Court with the supreme religious text. Both sacred texts, when understood in the light of history, evidenced that the ancient apostles, not to mention the ancient prophets, and the late founders encouraged slaves to obey their masters. Russell contrasted the actions and teachings of the apostles and views of the framers with those of the abolitionists, who dismissed the Constitution’s outdated instructions and believed that the Bible “belongs to a dark age.” He insisted that the teachings of the ancient apostles and those of the modern abolitionists “come into direct conflict with each other.” Furthermore, no one had questioned the framers’ fugitive slave clause until now, Russell asserted. Still, along with other antislavery writers, he believed that the framers had anticipated that “through the operation of the principles of freedom which the new Government would embody, under the influence of the religion of Christ, [the slave’s] chains would ultimately be knocked off, and he stand up in all the conscious dignity of a freeman. These expectations have been in some degree realized.” According to Russell, abolitionists’ radical efforts had arrested these expectations, setting back the expected “period of universal emancipation” fifty years. This reading, which Daniel Webster had also advanced in his Seventh of March speech, stood in direct contrast to that offered by other antislavery writers and later by Abraham Lincoln, which posited that proslavery consolidations rather than abolitionist innovations had choked the framers’ antislavery expectations. These debates about what constituted corruption spread awareness of historical change, even among interpreters set on ignoring historical distance in their biblical and constitutional interpretations. Examining these pamphlets at the Watkinson solidified one of my preliminary arguments: the Fugitive Slave Law brought together biblical and constitutional interpretation as had no other event in the nation’s history. It also confirmed another contention: the spread of historical awareness was uneven, as demonstrated in the continued commitment to static readings of the Bible and the Constitution. Indeed, while the slavery debate encouraged a number of readings that appealed to historical distance, just as often it inspired flat readings and a clear conflation of historical differences. In another sermon from late December, 1850, Episcopalian minister Nathaniel Sheldon Wheaton, a Yale graduate and former President of Trinity College, also appealed to both the Bible and the Constitution to encourage acquiescence to the Fugitive Slave Law. He cited the most scrutinized biblical text in the slavery debate, Paul’s epistle to Philemon, wherein Paul encouraged Onesimus to return to his master Philemon. Seeming to follow the reading of Moses Stuart, while omitting the careful historical research that accompanied the former’s analysis, Wheaton contended that because the apostle’s “certain peculiar circumstances … have become our own in every essential particular, we naturally recur to it for instruction.” Providentialism supported Wheaton’s disregard of historical distance: “we know and feel that we are doing right when, under parallel circumstances, we act as he did. One might almost suppose that the providence of God had anticipated the very crisis in which this country is now placed, and had caused this comparatively unheeded letter to be written as a guide to Christian consciences now.” Rather than insisting on the temporary nature of biblical passages, as so many liberal Christians now did, Wheaton appealed to “facts,” “circumstances,” and “ancient history,” to illuminate Paul’s actions and then proceeded to assert that the apostolic letter had more importance in 1850 than when it was authored. Wheaton’s historical reading had the purpose of ignoring the historical distance that such a reading could expose. One of his slaves, Onesimus, escaped from his bonds, and found his way to Rome, where St. Paul then was, an honourable prisoner within limits, but allowed to exercise the ministry. There, Onesimus hears the Apostle preach, and is converted to the faith in Christ, He seeks an interview with the Apostle, whom he had probably known as the house of his master in former days; confesses to him that he is a fugitive, and solicits his counsel. Many used the present tense to recount biblical passages, but the fluidity shown here seems notable. Regardless of whether or not this passage reflects Wheaton’s historical awareness, or lack thereof, it illuminates the ease with which interpreters spoke of the distant past as present. One last point about Wheaton’s interpretation bears mentioning as it highlights an argument that became powerful among conservative northerners and proslavery southerners. Although, in a number of instances, he ignored historical distance to emphasize the relevance of Paul’s example and to contrast it with that of the abolitionists, his central contention rested on an appeal to circumstances: “On a candid review of all these circumstances, I know not how an unprejudiced mind can evade the conclusion, that the holding of men to involuntary service is not, under all circumstances, inconsistent with Christianity.” Like many southern writers, Wheaton used historical precedent, in this case biblical precedent, to show that slavery is not of necessity evil and at odds with Christian belief. Here, Wheaton drew attention to a circumstantial difference, but one he called “an exception in regard to a single point.” He cited the “constraint of civil law,” recently bolstered in the Compromise of 1850, to show that the Americans’ imperative to return fugitive slaves was greater than Paul’s. In stark contrast to anti-slavery readings, the (sole) circumstantial difference Wheaton uncovered between the apostle’s time and his own supported southern slavery. Wheaton went further with his circumstantial argument, in suggesting that, with the prior assistance of New England ships during the colonial era, “domestic servitude has become so incorporated with the whole texture of southern institutions and society … that by no possibility can slavery be suddenly torn out, without the most deplorable consequences.” Some antislavery writers made a similar point about slavery’s relationship to New Testament times, but whereas they argued that Christ and his apostles had planted the seeds of slavery’s abolition, Wheaton argued that the approach of the first century must be applied in the nineteenth. In his argument, historical precedent and the historical change supported southern slavery. These sources, which represent only a few of the writings I read at the Watkinson, demonstrate the uneven development of historical awareness that resulted from the biblical and constitutional debates over slavery. A number of antislavery writers, especially abolitionists, used the historical distance that historical research revealed to either damn the nation’s sacred religious and legal texts or to argue for the need read them in relation to historical change and in light of historical distance. Many other writers, including moderate antislavery proponents, southerners, and some abolitionists proffered at least marginal historical readings, but then conflated the exposed historical differences and collapsed the revealed historical time to assert the relevance of the actions and beliefs of past figures. The emerging awareness of historical distance waxed and waned in this period, offering another example of the contingent and uncertain nature of historical development. However, even when antislavery and proslavery writers aimed to ignore historical distance in applying the lessons of sacred texts, their debates spoke to its presence. The fact that such distance had to be dismissed demonstrated an awareness of its reality. Slavery, more than anything else, contributed to that awareness in antebellum America. Samuel Cary, Ignorance of the True Meaning of the Scriptures, and the Causes of It. 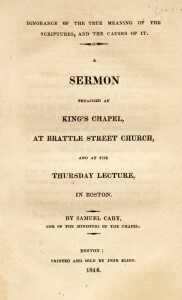 A Sermon Preached at King’s Chapel, at Brattle Street Church, and at the Thursday Lecture, in Boston (Boston: John Eliot, 1814), 14-15. [Nicholas Van Dyke,] Speech of Mr. Van Dyke, on the Amendment Offered to a Bill for the Admission of Missouri into the Union, Prescribing the Restriction of Slavery as an Irrevocable Principle of the State Constitution. 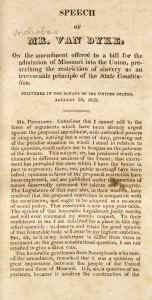 Delivered in the Senate of the United States, January 29, 1820 (n.p. ), 5. 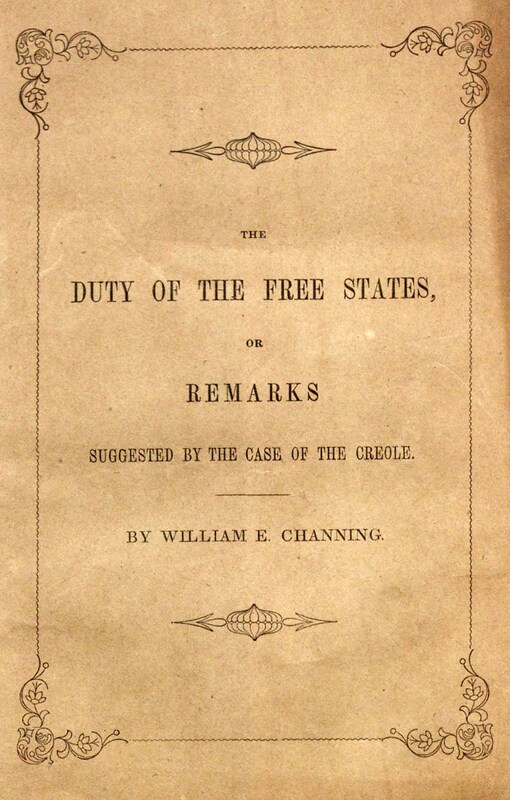 William Ellery Channing, The Duty of the Free States, or Remarks Suggested by the Case of the Creole (Boston: William Crosby and Company, 1842), 25. William Ellery Channing. The Duty of the Free States. Second Part (Boston: William Crosby and Company, 1842), 11. Ibid., 19. His emphasis on extracting the universal from the temporal is evident in his statement that “it is not only necessary to consult the history of the period of [the Constitution’s] formation, but to apply to it the principles of universal justice” (20). For example, while La Roy Sunderland acknowledged historical differences between the biblical past and the American present, and indeed contrasts biblical slavery from American slavery, he aims to condemn slaveholders via the Bible—“there is not one sin of any kind, committed at the present day, which is more directly and explicitly described in the language of the Bible”—despite those differences. In the last section, which follows antislavery extracts from the Old and New Testaments, Sunderland concluded with a series of quotes from eminent men of the “civilized world,” including the Americans founders, which he extracts from their context to condemn slavery. La Roy Sunderland, The Testimony of God against Slavery: A Collection of Passages from the Bible, which Show the Sin of Holding and Treating the Human Species as Property. With Notes. 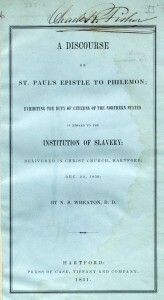 To which is Added the Testimony of the Civilized World Against Slavery (Boston: D. K. Hitchcock, 1836), 88. “Abolition vs. Christianity and the Union,” The United States Magazine, and Democratic Review 27 (July 1850): 8. Ibid., 6, emphasis in original. B. R. Allen, The Responsibilities and Duties of American Citizens. A Sermon, Preached in the Congregational Church, South Berwick, ME. Thanksgiving Day, Dec. 19, 1850 (Boston: Crocker and Brewster, 1851), 5, 8. 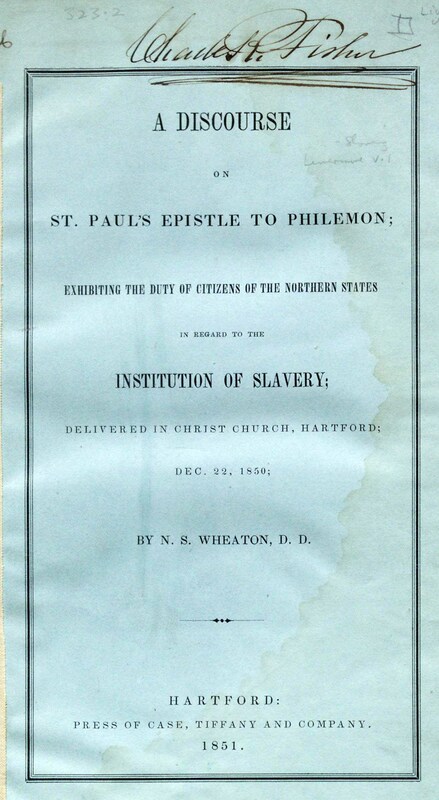 N. S. Wheaton, A Discourse on St. Paul’s Epistle to Philemon; Exhibiting the Duty of Citizens of the Northern States in Regard to the Institution of Slavery; Delivered in Christ Church, Hartford; Dec. 22, 1850; by N.S. Wheaton, D.D. (Hartford: Case, Tiffany and Company, 1851), 5. Ibid., 8, 9, 10, 13. You are currently browsing the archives for the NERFC category.